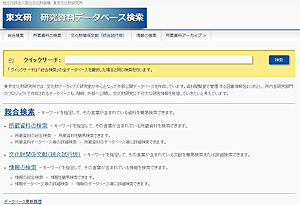 The Information retrieval system for the Research Materials Database (http://www.tobunken.go.jp/archives/) has been redesigned. This redesign reflects some of the work to create an Institute-wide research materials archive by the Archives Working Group last year. The Working Group falls under the Institute’s Archives Management Committee. The redesign involved extensive revamping of both the operability of the Information retrieval system and database content. The Institute’s Research Materials Database made information on Japanese volumes and in sales catalogs available online in 2002. Since then, the database has made available library information from different departments, information on sources in related fields, information on exhibitions, and information on traditional musical instruments. The database distributes useful content specific to institutes researching cultural properties. That said, database users asked for improved operability since they wanted to be able to Search Across Multiple Databases in the System, perform an Advanced Search Using Multiple Keywords, or Sort Search Results. The database was previously constructed using SQL, which is a database language, and Microsoft’s ASP.NET, which is a web application framework. These components have been changed to a combination of MySQL and WordPress (PHP). As a result, problems have been resolved and the database’s operability has improved. Content has been increased so that the database now has 530,000 pieces of information on papers and articles featured in the Institute’s publications. Previously, the database only included papers featured in the research journals Bijutsu Kenkyu (The Journal of Art Studies), Geino no Kagaku (Performing Arts Studies), and Science for Conservation. Now, however, the database includes various reports of research results, the Yearbook of Japanese Art, TOBUNKEN News(News from the National Research Institute for Cultural Properties, Tokyo), and Annual Reports. The database also includes bulletins and articles besides papers. As a result, access to articles describing the status of research projects and the Institute’s research results has improved. Approaches to facilitate access to highly specialized information and allow its efficient use are being considered. If you have any comments or questions about using the system, please let us know by using the database’s Comments or Questions form (http://www.tobunken.go.jp/archives/ご意見・お問い合わせ).